Captain Sailnator: Hi Annie! Thank you very much for taking the time for this interview. Just introduce yourself to my readers. Who are you? Annie: Wow, that’s a loaded question. At heart, I am an adventurer, a traveler, a writer, a sailor (with the mouth to prove it) and a lover of all things small and essential that make me savor time. Believe it or not, I used to be a lawyer. I would squeeze myself (because my “self” used to be much bigger) into stuffy suits and pantyhose and trek to the office to spend 12 hours every day under blaring fluorescent lights and the oppressive fog of my own stress and anxiety. Then I had one of those epiphanies that strikes you like lightning when I did something incredibly stupid and could have found myself flicked from this great life like an ant from a picnic table, but I wasn’t. I was still here. I was still alive. I was still young and I wanted so much more. I made the decision then to change everything. I got divorced. I moved out. I lost the house. I lost a lot of stuff (that turned out I never really needed anyway). I lost the desire to put on the pantyhose and head to the fog factory every day. I then met Phillip, my eternal adventure companion, and the rest is history. I quit the practice. 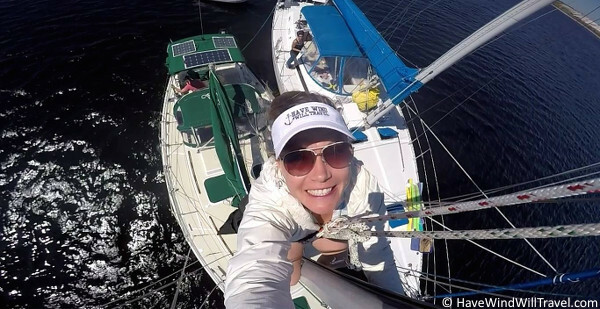 We bought a fantastic Niagara 35 sailboat, which we have cruised locally and along the coast of Florida to the Keys, for several years, and we are looking now to toss the lines this winter and head further south as commuter cruisers. This transition invigorated me and inspired me to spend the only commodity I see we really have—time—in a far more valuable way. By capturing my story in a book, Keys to the Kingdom, my goal is to inspire others to do the same. I now work to live, instead of the other way around, and as long as I have a laptop and functioning fingers, my writing affords me just enough to live everyday as an adventure. 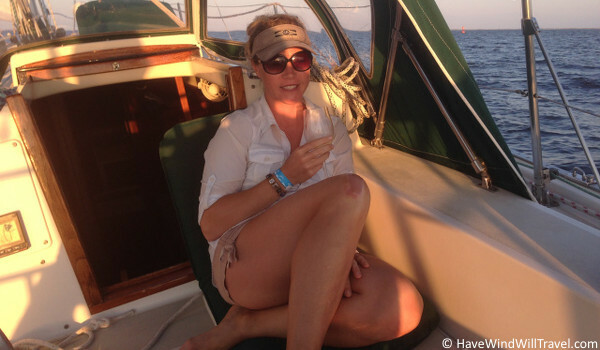 I have also found this freer lifestyle enables me to take opportunities as they come, as I was invited to crew aboard a 47’ Beneteau in the Abacos Regatta last year, and I will soon be crewing aboard a 46’ Soubise Freydis this June to cross the Atlantic ocean, a 4,000 nm non-stop journey from Florida to France that I will be sharing exclusively on Patreon. The Catamaran Annie will sail across the Atlantic in June 2016. She will share the adventure exclusively on Patreon! Life is incredibly full for this little sailor. Phillip and I currently live in Pensacola, Florida and are planning to transition from land lubbers to liveaboards this fall and prepare to do some more serious cruising to the Keys, Cuba, Isla Mujeres and eventually the Bahamas over the course of 2016-2017. Annie: While trying to be “cool” and impress a hot guy. I can’t take credit for the idea, really. It was Phillip’s idea. Always has been. 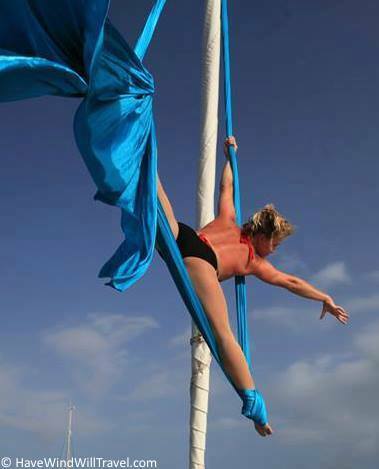 He was a shocking opposite to most of the men I was meeting at the time and his plans to live aboard a sailboat and cruise it around the world turned what I thought were my goals upside down. I told him he needed me as a travel companion and I haven’t looked back. Now, did I know how to sail? No. Did I think that mattered? Heck no! 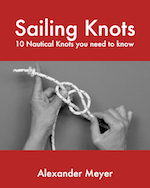 The tale of my wayward struggles to get my head wrapped around the difference between a “rope” and a “line” and every other blonde newbie sailor moment I documented in entertaining detail in my first sailing book, Salt of a Sailor, which covers my first passage ever on the boat, a true shakedown (sh$# happens and it did!) voyage bringing our boat home across the Gulf of Mexico. Annie: Most of it I lost in the divorce but looking back I would have gladly sold it all. There is a bit in my Keys book about these $260 solar-powered walkway lights that I bought to light the path to my McMansion. At the time I bought them, I thought nothing of it. If you’re going to have a big fancy house, you should probably light it up so people can see it, right? But, it was one of those things that really irked me when I started living a minimalist lifestyle. Man, what I wouldn’t do with that $260 now! Currently, Phillip and I live in a furnished condo. We have no furniture, no real paintings, knick knacks or dishes that we would really want to hold onto (except the pressure cooker! That thing is king on the boat!). Everything we really need is on the boat and it goes with us. I have an old 2001 Volvo that I bought off a friend during my “transition” that will serve as our car if we need it when we return, as we plan to do, often to Pensacola to handle business matters, visit friends and family, and earn a little extra money. We plan to stay with friends, rent or find a suitable AirBnB when we come to town to stay for a few weeks or months here and there and leave our boat staged somewhere south. 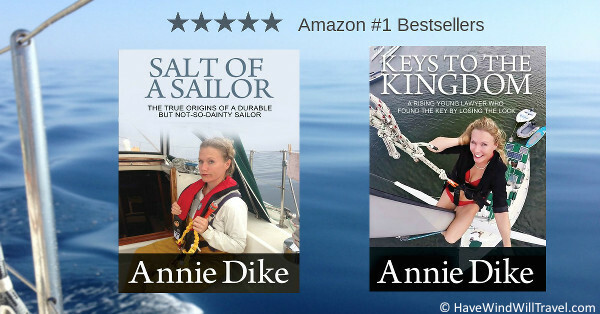 Annie: In a crash course, smackdown across the Gulf of Mexico. It’s all in the salty book! I kept calling lines (once I trained myself to call them “lines”) by their colors as opposed to their functions. The main halyard was the “orangey” line, the Genny sheets were the “big red lines” and so on. I was a mess. But, luckily I was hearty and a quick learner and Phillip was patient. I learned OTJ. 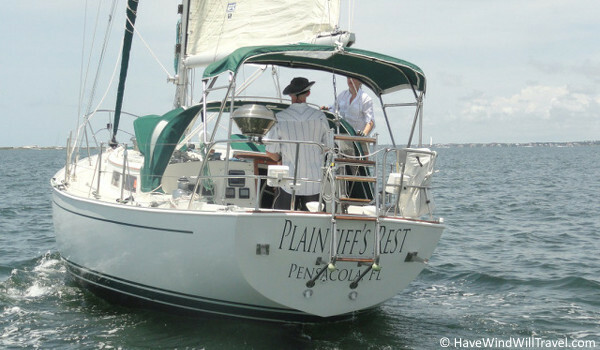 But, after the beat-down passage and an incredible summer and winter sailing our fantastic local waters and anchorages around Pensacola, Phillip and I sailed our Niagara on a 6-week passage down to the Florida Keys and back in 2014 and handled it, just the two of us, very comfortably. Annie: The answer to this question is always … the prettiest one. I will say I truly believe we have the perfect boat for us. I did not know it at the time when we purchased the boat. Being a sailing and liveaboard newbie, I really did not have much experience to offer by way of “I prefer this to that” so Phillip took on the brunt of the research and shopping, but I knew when I stepped aboard the boat that it “felt right” to me. We have a 1985 Niagara 35. It is Canadian built by Hinterhoeller. Many are familiar with the C&C Nonsuches. This is Hinterhoeller’s sloop version. Having now lived aboard and sailed the boat many places I believe 35 feet is plenty of feet for us. We do have a 50’ mast which limits us on occasion around our local areas with certain bridges but it has not been much of a deterrent as we like to sail offshore. Our draft is 5’2” which we like to think of as 6’ once she’s fully loaded (wine and booze really raises that water line!) which does keep us mindful often of shoals and shallow bottoms. We recently underwent a pretty extensive re-fit of the boat after we found the stringers under our mast step were rotted, crushing and would have to be rebuilt. This was the result of a clogged weep hole in the mast step (a very simple fix) but an on-going problem we were unaware of which caused water to continually seep into our stringers which were not glassed on top. We had planned to replace the original 1985 rod rigging this winter anyway, so pulling the mast to also repair the stringers wasn’t too significant of a blow. However, the aftermath of problems and issues upon issues upon issues that you find when your boat is on the hard and that “should be” fixed felt a bit like an Atomic bomb. I documented our three-month stint in the yard in hilarious detail in Season Three (“Hard Times on the Hard”) of my YouTube channel and can easily say, now that it is behind us, I am glad that it all played out the way it did. Our boat is now stronger than ever and Phillip and I are now far more familiar with her (every hose, screw and cubby) and we are going to be far more adept, proficient cruisers because of it. We joke that we should have received a DIY Crash Course certificate from the yard for our efforts. We were quite the comical pair out there trying to do everything ourselves and often goobering (that’s a technical term) everything up before the professionals could stop us. Captain Sailnator: Did you have the help of an agent or surveyor and which hidden problems did you find later by refitting the boat? 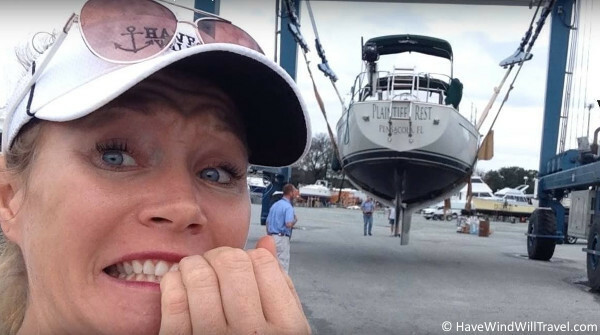 Annie: I get a lot of questions about this because of the experience we have shared in discovering rotten stringers under our mast step three years after purchasing the boat. Many came down very harsh stating the surveyor who performed our purchase survey should have found this issue. In order to find our issue, assuming it was even visible three years prior, the surveyor would have had to pull all of the floorboards and remove the shims on top of the stringers. Personally, I have never seen a purchase surveyor spend that kind of time and I’m not sure he should have or could have discovered it, even if he did. I believe with boats, a lot of it is just luck. Some people will kick the hull once, buy it and never have an issue. Others will order three thorough top-to-bottom surveys but an unbeknownst-to-anyone issue will rear its head in the first three years and cause a major haul-out re-fit. They’re boats. Things are hidden. Things are going to happen. Take it all with a grain of salt and view it all as a learning experience. 15. A thousand other things … I can’t remember them all! Annie: Strengthened it 100%. I would circumnavigate the world with Phillip tomorrow. Annie: No and Heck No! If you can afford not to, don’t do it! Phillip and I spent enough time at the yard (roughly 5-6 hours every day) to know what it would feel like to live there during the re-fit. Plus the boat was in total shambles during the process. I had almost forgot she could be lived upon when we first put the floorboards back down after three months. I imagine living there during the re-fit would be a significant strain. Captain Sailnator: Was the refit on the expected budget or was it more expensive? Annie: I hate to say it, but it’s almost laughable you asked that question. Easily more expensive. Three times. And we tried to do as much as we possibly could ourselves to save on professional man hours. We were frugal and cautious. But, you want to do right by your boat and you always discover more that needs to be done than you envisioned. It’s hard to justify not doing it if it means compromising performance or safety. Captain Sailnator: What are you doing for a living? Annie: I feel very fortunate, after having left the practice and the cushy salary three years ago, that I can now claim sufficient, comfortable income from my writing and creating alone. I began writing books as a way to make income remotely and learned the hard way how incredibly hard it is to market and sell books. 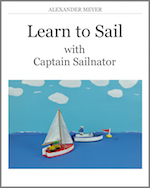 I did an interview (two actually) on Sail Loot discussing this learning process in detail. In trying to learn how to market my books I stumbled upon the idea of putting those marketing skills to work for others. I now have several clients whom I write marketing copy for (emails, newsletters) and handle their social media posting and campaigns. 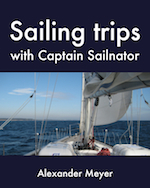 I have also written and published two books on sailing which I was proud to see debut as #1 Sailing Books on Amazon, but I have to work incredibly hard to continue growing my HaveWindWillTravel platform to continue to see sales from those. I only recently began the YouTube video venture last fall and am still making all of the mistakes there are to possibly make there. It is quite the mystery … that YouTube. I also have a new book coming out this May (I must leave my followers with something to “gnaw on” while I’m off galavanting in France!) which is going to be a comical tale about the infamous Mitch from my Salt of a Sailor book and his wildly entertaining voyage through the nine stages of just-bought-a-boat grief after he bought a Nonsuch 30’. You know, first you’re in shock, then denial … It’s called None Such Like It and should be a lot of fun. After travel (food and wine), writing is my one true passion! 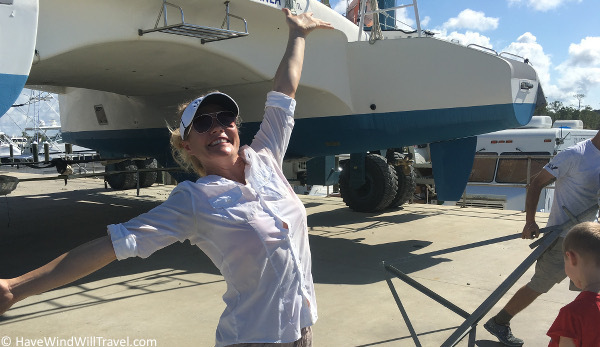 My goal is to share the realities and rewards of a cruising lifestyle and inspire others to follow their dreams to live a simpler, more fulfilling life. Get inspired. Get on board at HaveWindWillTravel.com! Captain Sailnator: Annie, thank you so much for this interview. I think your story is an inspiration for all of us. I wish you even more success with your books, your blog and your youtube-channel and I am looking forward to upcoming adventures. Always fair winds and may be one day we will meet each other – out there on the roaring sea!